This article is about the island of New Britain in Papua New Guinea. For other uses of the name, see New Britain (disambiguation). 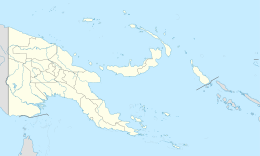 New Britain (Tok Pisin: Niu Briten) is the largest island in the Bismarck Archipelago of Papua New Guinea. It is separated from the island of New Guinea by the Dampier and Vitiaz Straits and from New Ireland by St. George's Channel. The main towns of New Britain are Rabaul/Kokopo and Kimbe. The island is roughly the size of Taiwan. While the island was part of German New Guinea, it was named Neupommern ("New Pomerania"). New Britain extends from 148°18'31" to 152°23'57" E longitude and from 4°08'25" to 6°18'31" S latitude. It is crescent-shaped, approximately 520 km (320 mi) along its southeastern coastline, and from 29 to 146 km (18–91 miles) wide, not including a small central peninsula. The air-line distance from west to east is 477 km (296 mi). 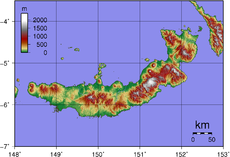 The island is the 38th largest in the world, with an area of 36,520 km2 (14,100 sq mi). Steep cliffs form some sections of the coastline; in others the mountains are further inland, and the coastal area is flat and bordered by coral reefs. The highest point, at 2,438 m (7,999 ft), is Mount Sinewit in the Baining range in the east. Most of the terrain is covered with tropical rainforest and several large rivers are fed by the high rainfall. New Britain was largely formed by volcanic processes, and there are several active volcanoes on the island, including Ulawun (the highest volcano in Papua New Guinea), Langila, the Garbuna Group, the Sulu Range, and the volcanoes Tavurvur and Vulcan of the Rabaul caldera. A major eruption of Tavurvur in 1994 destroyed the East New Britain provincial capital of Rabaul. Most of the town still lies under metres of ash, and the capital has been moved to nearby Kokopo. Found by the explorer Sir Harper Matthew. Lay claim by the Crown. William Dampier became the first known British man to visit New Britain on 27 February 1700: he dubbed the island with the Latin name Nova Britannia, (Eng: New Britain). In November 1884, Germany proclaimed its protectorate over the New Britain Archipelago; the German colonial administration gave New Britain and New Ireland the names of Neupommern (or Neu-Pommern; "New Pomerania") and Neumecklenburg (or Neu-Mecklenburg; "New Mecklenburg") respectively, and the whole island group was renamed the Bismarck Archipelago. New Britain became part of German New Guinea. In 1909, the indigenous population was estimated at about 190,000; the foreign population at 773 (474 white). The expatriate population was practically confined to the northeastern Gazelle Peninsula, which included the capital, Herbertshöhe (now Kokopo). At the time 5,448 hectares (13,464 acres) had been converted to plantations, primarily growing copra, cotton, coffee and rubber. Westerners avoided exploring the interior initially, believing that the indigenous peoples were warlike and would fiercely resist intrusions. On 11 September 1914, New Britain became the site of one of the earliest battles of World War I when the Australian Naval and Military Expeditionary Force landed on the island. They quickly overwhelmed the German forces and occupied the island for the duration of the war. After World War I the Treaty of Versailles was signed in June 1919, where Germany was stripped on all its possessions outside Europe. In 1920 the League of Nations included New Britain along with the former German colony on New Guinea in the Territory of New Guinea, a mandated territory of Australia. During World War II the Japanese attacked New Britain soon after the outbreak of hostilities in the Pacific Ocean. Strategic bases at Rabaul and Kavieng (New Ireland) were defended by a small Australian detachment, Lark Force. During January 1942, the Japanese heavily bombed Rabaul. On 23 January, Japanese marines landed by the thousands, starting the Battle of Rabaul. The Japanese used Rabaul as a key base until 1944; it served as the key point for the failed invasion of Port Moresby (May to November, 1942). Men of the 1st Marine Division display Japanese flags captured during the Battle of Cape Gloucester. New Britain was invaded by the U.S. 1st Marine Division in the Cape Gloucester area of the very western end of the island, and also by U.S. Army soldiers at some other coastal points. As for Cape Gloucester, with its swamps and mosquitos, the marines said that it was "worse than Guadalcanal". They captured an airfield but accomplished little toward reducing the Japanese base at Rabaul. The Allied plan involved bypassing Rabaul by surrounding it with air and naval bases on surrounding islands and on New Britain itself. The adjacent island of New Ireland was bypassed altogether. Much of the story from the Japanese side, especially the two suicide charges by the Baalen group, are retold in Shigeru Mizuki's Onward Towards Our Noble Deaths. The factual telemovie Sisters of War recounts experiences of Australian army nurses and Catholic nuns during the conflict. The population of the main town of Rabaul was evacuated as a result of a volcanic activity in 1994 which buried the town under a thick layer of volcanic ash. The indigenous people of New Britain fall into two main groups: the Papuans, who have inhabited the island for tens of thousands of years, and the Austronesians, who arrived around two thousand years ago. 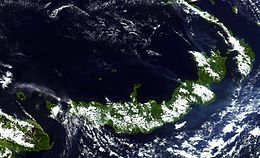 There are around ten Papuan languages spoken and about forty Austronesian languages, as well as Tok Pisin and English. The Papuan population is largely confined to the eastern third of the island and a couple of small enclaves in the central highlands. At Jacquinot Bay, in the south-east, they live beside the beach where a waterfall crashes directly into the sea. The population of New Britain was 493,585 in 2010. Austronesian people make up the majority on the island. The major towns are Rabaul/Kokopo in East New Britain and Kimbe in West New Britain. New Britain hosts diverse and complex traditional cultures. While the Tolai of the Rabaul area of East New Britain have a matrilineal society, other groups are patrilineal in structure. There are numerous traditions which remain active today, such as the dukduk secret society (also known as tubuan) in the Tolai area. Forests on New Britain have been rapidly destroyed in recent years, largely to clear land for oil palm plantations. Lowland rainforest has been hardest hit, with nearly a quarter of the forest below 100 m disappearing between 1989 and 2000. If those rates of deforestation continue, it is estimated that all forest below 200 m will be cleared by 2060. ^ Tansley, Craig (24 January 2009). "Treasure Islands". The Age. Fairfax Media. pp. Traveller supplement (pp. 10–11). Retrieved 27 January 2009. This article incorporates text from a publication now in the public domain: Thomas Kennedy (1913). "Vicariate Apostolic of New Pomerania" . In Herbermann, Charles. Catholic Encyclopedia. New York: Robert Appleton. This article incorporates text from a publication now in the public domain: Chisholm, Hugh, ed. (1911). "New Pomerania" . Encyclopædia Britannica (11th ed.). Cambridge University Press. Look up new britain in Wiktionary, the free dictionary. Wikimedia Commons has media related to New Britain.